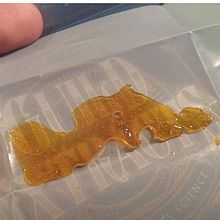 Hash oil, also known as honey oil or cannabis oil, is an oleoresin obtained by the extraction of cannabis or hashish. It is a concentrated form of cannabis extracts containing many of its resins and terpenes – in particular, tetrahydrocannabinol (THC), cannabidiol (CBD), and other cannabinoids. There are various extraction methods, most involving a solvent, such as butane or ethanol. Hash oil is usually consumed by smoking, vaporizing or eating. Hash oil may be sold in cartridges used with pen vaporizers. Preparations of hash oil may be solid or colloidal depending on both production method and temperature and are usually identified by their appearance or characteristics. Color most commonly ranges from transparent golden or light brown, to tan or black. Cannabis retailers in California have reported about 40% of their sales are from cannabis oils. Hash oil is consumed usually by smoking, ingestion, or vaporization. Smoking or vaporizing hash oil is known colloquially as “dabbing”, from the English verb to daub (Dutch dabben, French dauber), “to smear with something adhesive”. Dabbing devices include special kinds of water pipes (“oil rigs”), and vaporizers similar in design to electronic cigarettes. Oil rigs include a glass water pipe and a hollow tube (called a “nail”), with an indentation on the side which is sometimes covered with a dome. The pipe is often heated with a gas blowtorch rather than a cigarette lighter.